Here's the penultimate draft of something in Free Inquiry, out now. If gratuitous evil exists, then God does not exist. 'Evil', in this context comes in two varieties: (i) moral evils such as the morally bad things we do as free moral agents (we start wars, murder, steal, etc.) and (ii) natural evils such as natural diseases and disasters that cause great suffering. So-called 'gratuitous' evils are evils for which there exists no God-justifying reason. Perhaps God has good reason to allow some evils into his creation if that is the price that must be paid for greater goods (there are examples below). But surely God, as defined above, won't allow pointless, gratuitous evils: evils he lacks a good reason to allow. So it appears the first premise of our argument is true: if gratuitous evils exist, then God does not exist. Is the second premise true? Surely it is. Consider human suffering. Take, for example, the appalling psychological suffering a parent must go through who has to watch, helpless, as their child dies slowly of starvation or an agonizing disease. The consensus among population experts is that, over the sweep of human prehistory - around two hundred thousands years - the parents of each generation have had to watch, on average, between a third and a half of their under-five children die. It's only very recently that we have managed to bring childhood mortality rates down. The appalling suffering of these preceding generations of children and their parents was not something they brought on themselves. Then consider animal suffering. A while ago I watched a wildlife documentary about Komodo dragons poisoning, tracking for a week or so, and then, finally, when their victim became too weak to defend itself, disembowelling and eating alive, a water buffalo. The cameraman said this had been his first ever wildlife assignment, and it would probably also be his last, because he couldn’t cope with the depth of suffering he had been forced to witness. That was just one poor creature. Each day, millions of animals are similarly forced to tear each other limb from limb to survive. And this has been going on for hundreds of millions of years. This is, in many ways, a beautiful world. But it’s also a staggeringly cruel and horrific world for very many of its inhabitants. Unspeakable horror on an almost unimaginably vast scale is built into the very fabric of the world we find ourselves forced to inhabit. Surely, as we look back across the aeons, we witness suffering of such depth and on such a vast scale that it becomes highly implausible that there's a good, God justifying reason, not just for some of it, but for every last ounce it. And if there is any gratuitous evil at all, then there is no God. How might theists respond to this argument? The problem can sidestepped by simply dropping any one of the three omni-attributes. Suggest, for example, that God is omnipotent and omniscient, but not omnibenevolent. He knows about the suffering and has the ability to prevent it, but, being less than entirely good, chooses not to. However, for most religious monotheists, these moves are unavailable. Most religious monotheists are fully committed to the three-Os God. God desires that we do good of our own free will. He could have made us puppet beings that always did the right thing, but puppet beings aren't responsible for their actions, and so deserve neither praise not blame. To allow moral goodness - good done by free agents of their own volition - God had to cut our strings and set us free. Given that freedom, some then choose to do evil. That is the price God unavoidably pays for the very great good of allowing moral goodness enter his creation. Those who have suffered sometimes say they don't regret their suffering. We can learn valuable lessons as a result of having been through, say, a difficult illness The pain and suffering of others also gives us opportunities - for example, to help others and act in morally virtuous ways. Much pain and suffering can be explained in terms of the opportunities it offers to grow and develop morally and spiritually. No pain, no gain. The laws of nature that govern our universe bring various goods. Perhaps the most obvious good is this: in order for us to be able to interact effectively with each other as free moral agents, we need to know we live in a stable, regular universe. Suppose I see you are cold and hungry. Here is an opportunity for me to help you. I might light a fire to warm you and cook you some food, for example. But I can only do this if I know that a spark produces a flame, that a flame produces heat, that the heat will warm you and cook the food, and so on. Without knowledge of such regularities, we can't properly interact with each other as free moral agents. So God creates such regularities to allow for these and other goods. However, these same laws of nature also result in tectonic plate movements that in turn cause earthquakes and tsunamis that cause great suffering. That suffering is the unavoidable price God pays for such greater goods. The three theodicies outlined above are for illustrative purposes only. There are many more. Each theodicy, considered in isolation, has its limitations. For example, while the free will theodicy might explain some human suffering - that caused by our free human actions - it hardly explains the hundreds of millions of years of animal suffering before we arrived on the scene. Nor does it explain two hundred thousand years of parents and children suffering as a result of causes beyond their control. There's a similar problem with the character-building theodicy. Perhaps some suffering is necessary to build our characters. But why hundreds of millions of years of animal suffering? 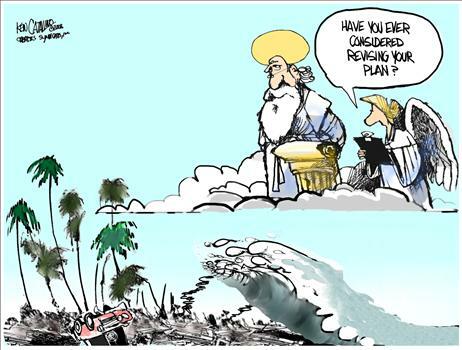 Was God trying to build the character of the dinosaurs with the K-T mass extinction event? And how plausible is it that the distribution of human suffering is there to improve our characters? Slowly killing children on an industrial scale doesn't very obviously improve either their characters or the characters of their parents. Indeed, many of us bow out of this life not with our characters improved by our suffering, but in utter despair, psychological and physically crippled by the torments that have been inflicted on us. Still, it might be suggested that these and other theodicies, even if they don't individually deal with the evidential problem of evil, do at least collectively begin to bring it down to size. We can, say some theists, begin to see that it's not so very unreasonable to believe in God, notwithstanding all this horrific suffering. Many theists would add that we should acknowledge that even if we can't explain all that suffering, it does not follow, and it is not reasonable for us to conclude, that there is no explanation. Why suppose that there are gratuitous evils? Because we cannot think of a God-justifying reason for them? But if there are God-justifying reasons for those evils, those reasons could easily lie beyond our ken - beyond our limited human comprehension. So we're not justified in concluding that there are any gratuitous evils. This is the response of the so-called 'skeptical theist': the theist who is skeptical about our ability to know God-justifying reasons. Skeptical theism is currently one of the leading philosophical responses to the problem of evil. Do these and other theodicies, perhaps in combination with skeptical theism, deal successfully with the evidential problem of evil? I don't believe so. To see why, consider a different god hypothesis. Suppose that there is indeed a single omnipotent and omniscient deity. Only this being is not omnibenevolent but omnimalevolent. His cruelty is beyond our comprehension. His malice knows no bounds. Who believes in a God like that? Almost no one, of course. But why not? After all, notice that many of the most popular arguments for the existence of God provide no clue as to his moral character. Teleological or design arguments, for example, typically conclude only that there is some intelligence behind the universe. Such arguments, as they stand, supply no more support for a good God than they do an evil god. The same is true of many cosmological arguments (arguments for a first cause or prime mover, etc. based on the thought that the universe requires some cause or explanation). If gratuitous good exist, evil god does not exist. Therefore, evil god does not exist. Yes, the universe contains much evil. But it also contains a great deal of good. Arguably far too much good to allow anyone reasonably to believe this world is the creation of such a powerful and malevolent being. Why all the love, laughter, ice-cream, and rainbows? Why does an evil God allow us to see beauty, allow us to help each and reduce suffering, give us children to love who love us unconditionally in return? Perhaps an evil god will allow some goods as the price paid for greater evils, but surely at least some of the goods we observe are gratuitous in the sense that there's no evil-god-justifying reason for them. Surely, if the world were the creation of an evil god, it would like much more like a vast torture chamber. Notice the evidential argument from good mirrors the evidential argument from evil. In each case, we note that the world just doesn't look as we should expect if there really was such an omnipotent deity responsible for it. Is the evidential argument from good an effective argument against belief in an evil God? What if, in its defence, I make the following suggestion? Why would an evil God allow us to help each and so reduce suffering? Surely an evil God would clamp down on such benevolent behaviour, which thwarts his evil desires? Here's an explanation. Evil god desires that we do evil of our own free will. He could have made us puppet beings that always did the bad thing, but puppet beings are not responsible for their actions, and so deserve neither praise not blame for their actions. To allow moral evil - evil done by free agents of their own volition - evil god had to cut our strings and set us free. given that freedom, some of us choose to do good. That is the price paid by evil god for the very great evil of allowing moral evil to enter his creation. Clearly, the above free will theodicy mirrors the standard free will theodicy that I outlined earlier. And in fact very many theodicies (if not all) can be similarly mirrored. Here are two more examples. Why does an evil god allow love, ice-cream, rainbows, and healthy, wealthy, happy folk? Again, explanations are available. Consider the suffering of parents who had had to watch around a third of their children die under five for the last two hundred thousand years. If these parents did not love their children, they would not suffer nearly so much. Love is a necessary precondition of some of the most appalling forms of suffering. Evil god will also allow some goods - rainbows, for example - as a contrast: to make the dreariness and ugliness of the rest of his creation all the more obvious. And he will no doubt give a few people wonderful things - great wealth and privilege, for example, in order to make the rest of us feel resentful and jealous. Resentment and jealousy are so-called 'second order' evils requiring the 'first order' good of some people having great stuff. Why would an evil god give us delicious ice-cream? Ice-cream has to be tasty to tempt us to eat it, and to make ourselves fat, miserable, and guilt-wracked for succumbing to that temptation. We can begin to see that what goods there are all exist for an evil reason: to intensify our pain and misery. Without a stable, law-governed universe, various important evils are unavailable to an evil god. Suppose I want to commit some horrible crime - kill you and your family, say. That's something an evil god will want to allow. But to commit such a crime, I need to know that when I strike a match it will produce a flame, when a pour petrol through your letterbox and throw the match it will ignite, and that the resulting fireball will kill you and your family. Without knowledge of such regularities, we cannot properly interact with each other as free moral agents, and thereby create moral evil. So evil God creates such regularities. However, the downside to the same laws of nature that result in the fireball is beautiful rainbows and other goods. Beautiful rainbows are the price evil god pays for such evils. Notice that a defender in belief in an evil God, just like a standard theist, can also supplement their theodicies by appealing to skeptical theism. For if reasons that would justify a good God in allowing evils are likely to be beyond our ken, then reasons justifying an evil god in allowing goods are no less likely to be beyond our ken. If our inability to think of God-justifying reasons for observed evils fails to justify the conclusion there are no such reasons, then our inability to think of evil-god-justifying reasons for observed goods similarly fails to justify the conclusion that there are no such evil reasons. It appears that these various defences of belief in an evil God are about as effective as the standard theistic defences of belief in a good God. So why is belief in a good God very significantly more reasonable than belief in an evil god? Theists invariably do think belief in a good God, if not 'proved', is at least by no means unreasonable. Yet they consider the evil god hypothesis absurd, which surely it is. How do they account for this difference in reasonableness? After all, these two god hypotheses appear to receive roughly similar support from the standard teleological and cosmological arguments, at least considered in isolation. Both hypotheses face an evidential problem (in the form of good or evil) but then in each case a response is available in form of theodicies and appeals to skeptical theism. Yet, surely, the evil god hypothesis is absurd. Surely, we can reasonably rule out an evil god on the basis of observation, notwithstanding the various ingenious mirror theodicies we have now cooked up, plus skeptical theism. So why is the good God hypothesis significantly less absurd? I don't believe there is a satisfactory answer to this question. True, answers have been offered. Some theists insist there are cogent arguments for a good God not mirrored by arguments for an evil god. There are moral arguments specifically for a good God, for example. However, even many theists find these arguments unpersuasive. Or perhaps the theist will insist that religious miracles, religious experiences, and scripture supports belief in a good God, there being no comparable evidence for an evil god? But there are numerous religions and each has its own stock of miracles, religious experiences, and scriptures. These religions contradict each other, having received incompatible messages and directives from their respective god(s). This is a recipe for endless strife and conflict. Now isn't revealing himself in such dangerously misleading ways just the sort of recipe an evil god would follow? Surely a good God would avoid generating such confusion and hostility? So perhaps miracles, etc. are, on closer examination, better evidence for an evil god than a good God. We might not know why the universe exists. But surely we can still reasonably rule out the suggestion that it is the creation of either of these two gods. What we haven't done, as yet, is explain precisely what is wrong with the theodicies, mirror-theodicies, and also with skeptical theism, as responses to the problems of evil and good. Explaining that requires more space than is available here. But I'll finish with this suggestion: that the strategy of constructing theodicies/mirror theodicies to explain away the observed good/evil suffers the same fundamental defect as the strategy of Young Earth Creationists who, in response to powerful evidence that the Earth is much older then 6,000 years, proceed to cook up endless convoluted explanations in terms the biblical Flood, etc. to explain that evidence away. When we are presented with powerful evidence against what we believe, it is always possible to cook up such explanations. That doesn't mean it's not good evidence. Take this case: can God create a rock that is too heavy that he cant move it. If God is omnipotent then this is a paradox; because there is nothing that he cannot move. can such an argument be issued with existence; an existence without any natural calamity and suffering is a paradox? because it is somehow embedded in the nature of the existence (or at least practically impossible). In the book of John, chapter 13, we read that Christ washes the disciples' feet. "In the washing of feet God (Christ) is kneeling before men. This is an image which shocks, and this is the light which we must attain. This is the reversal of the Gospel. This puts us in front of a man kneeling before God (Christ)who is kneeling before (His) Creation, that is to say before a God unable to force the door of our heart, before a God who is the first not only to respect our dignity but who is the founder of that dignity. We come before a God who immediately admits to being powerless against all human endeavours to deny Him. The Cross presents us with a God who is strictly conditioned by our YES. If our YES does not happen, if our YES does not totally take hold of us, God is reduced to powerlessness, and this powerlessness is brought into focus on the Cross." Inasmuch as it is humanly impossible to form a concept of any kind of absolute, "omni-" terms are pretty useless in almost any kind of discourse. As Wittgenstein might have said, "Whereof one cannot form a concept, thereof one must be silent." Richard: Sorry, that doesn't follow. Leaving aside that the physical body of Jesus was only a temporary shell, you do NOT get to say on the one hand "omniscient, omnipotent, etc etc etc" and on the other hand "but if you say no he can't do anything." That is a maudlin appeal to emotion, the kind I used to slurp up like iced tea when I was a Catholic. It's also internally incoherent, for the reasons I mentioned above. Besides, even going on the assumption that we have free will (we do not if Yahweh is truly omni-$ATTRIBUTE), the story of Exodus very clearly shows that Yahweh does not give two shakes for it. Look what he did to the Pharaoh! And if you wish to discard the omni-etc tags...what are you left with, and WHY should one worship it? Any being that demands worship is by definition unworthy of it; a truly perfect being has no wants, needs, or desires, including worship. Evil exists only in the behaviour and languages in mankind. The universe is remains at peace or rest (moment of inertia) sustained by its causal law of cause and effect...Mankind in in its 'Free Will" ignorantly imbalance this Universal Law through their acts for survival... and 'What you sow so shall you reap" effects all mankind in evil.For there is no sustaining Good. Marissa: I think I can see where you're coming from, even though your post seems like a series of non sequiturs. And I'm glad that you are not slurping up any ideas (Catholic or otherwise) like iced tea any more. However your last paragraph raises some interesting questions. I am wondering how you get to talk about a "truly perfect being". Any being totally devoid of "wants, needs, or desires" sounds like no kind of being at all. Or a stone. You replace the "omni-attribute" terminology with "perfect being", then proceed to on to an assertion about what the perfect being is NOT. It would be helpful if you could tell us what allows you to make that assertion. I must confess that your ideas sound a lot like the kind I used to slurp up like iced tea when I was an atheist. what if there are 2 gods, one good and one evil and we are reluctant witnesses to their duel? That would explain the mix we observe? Peter Jones: You must be a reincarnated Cathar! 1. If gratuitous evil does NOT exist, God does not exist. 3. Therefore God does not exist. 2. Gratuitous evil does NOT exist. Whatever is evil is not of God. To those who truly believe that, there is no theological problem of evil. The existence of evil is a mystery which can be emotionally challenging, but there is comfort in believing that darkness will give way to light. Right, I'm the first Anonymous on this post, and I think Stephen's original logic was correct after all. Oops!! I really shouldn't try to process logic on the fly; learnt that lesson now. Anonymous 2, I think atheists and agnostics are looking, or at least ostensibly looking, for a rational or fair basis, rather than being asked to accept selected verses from the Bible ... to take evangelical Christianity on its own terms, perhaps the fair test is to attend (say a month's worth of) evangelical church services (especially around Easter time) with an open mind (impossible for anyone else to test!) and see whether the New Testament teaching is true ... does the Holy Spirit give you the gift of repentance and faith through hearing the preaching of the gospel? Remember C.S. Lewis described himself as 'perhaps the most reluctant convert in the whole of Christendom'. Anonymou: "see whether the New Testament teaching is true"
You are hoping that emotions/feelings will trump the cold, hard razor of logic. As they always do, for everybody, in the process called falling in love. Thank you for your challenge, Richard. But I'm not 'hoping that emotions/feelings will trump' ... I'm thinking more holistically. That's why I said 'open mind', i.e. endeavouring to have a fair-minded attitude: I wasn't talking about laying aside one's critical faculties. Anyway, gotta go. I'm finding a book called 'The Message of Evil and Suffering' by Peter Hicks really interesting and, well, good. It has some ideas that Christians believe based on various Bible passages that I don't remember being covered e.g. in the debate between Stephen and Bill Craig. I'll mention three here, and I haven't finished reading the book myself anyway. A. Noah and the Flood. 1. God saw there was - well, gratuitous [human] evil (as a result of the Fall). 2. It caused him suffering (so not an impassive deity). 3. He decided on an act of decreation, to put an end to the gratuitous evil. Yet, as I say, Jews and Christians continue in their faith. The eternally scarred Son of God, predestined before the universe began as a sacrifice for sin. God suffering, rather than being a detached deity. The idea that evil is defined in the Bible not in relation to Enlightenment considerations of human happiness but as rebellion against God. As I say, I think this book provides some useful considerations and depths of thought for both atheists and Christians when considering evil in relation to Christian Theism. In Hinduism evil is not at all a problem. We say Brahman is neither good nor evil and that both good and evil have come from Brahman. "surely God, as defined above, won't allow pointless, gratuitous evils"
The problem is the word 'allow'. A good God cannot allow gratuitous evil (is there any other kind of evil? ), but it doesn't follow that if such a God exists, evil cannot exist. That inference presupposes an anthropomorphic view of God modeled on ourselves. Maybe God doesn't have the capacity to 'allow' or 'disallow', (perhaps because such a capacity is an imperfection). What I mean is, it would be absurd to say that the number seven 'allows' or 'disallows'. Perhaps, in that respect, God is in the same ontological category as the number seven (but is also like us in some ways). The anthropomorphic view of God is a model, but like all models, it is only useful in limited contexts and is not a faithful representation of the real thing (in every respect). Like all models, the anthropomorphic view is a simplified and distorted version of the real thing, that serves certain heuristic purposes. The problem of evil may be a flaw in the model rather than in God. You make a very good point, Anonymous. Back in the days when I participated in debates on the Unbelievable forum, I would anger both atheists and Christians by saying, "You ask me to talk about God. As a Christian, I will accept to do so just as long as you understand that as soon as I open my mouth, I will only be talking about myself." All models of God will be flawed and based on an anthropomorphic view since our language will obviously be, er, anthropomorphic. I would go further and say that my language will describe a Richardomorphic God. One can use the word "omnipotent" but it will be virtually useless, because our minds are quite incapable for forming a concept of omnipotence - all- powerful. At best I can conceive of very, very powerful. And even when doing do, I will be describing a concept of a very, very powerful.... man. A super-Richard if you like. one does not need to imagine omnipotence or omniscience at all (it is not possible, agree) but as both are terms and concepts made and used by humans, they can be checked for validity using logic (also a human, not supernatural tool, very well applicable to concepts). Take the famous question of omnipotence: if god is omnipotent, can he create a stone he will not be able to move? Another one is Immanuel Kant's question of who created the creator: if there is cause and effect then what/who created god? Nice beginning for understanding, that most of concepts like omnipotence or omniscience are simply not useful at all in explaining reality, but great for explaining the real world *away*. Cheers. And: thank You for the nice Article Stephen. Towards the end "than" rather than "then". What you allude to is cognitive dissonance reduction. Cooking up rationalizations is precisely that. In the face of incontrovertible evidence, in order to preserve belief, people will rationalize ad infinitum. This has been observed in cult after cult and religious group after religious group. When Harold Camping's prediction failed, he simply stated that he miscalculated and then made a new prediction. He died and yet his predictions haven't passed. The Seventh Day Adventists were born out of such a cult that believed it had predicted the second advent of Christ. It can be argued that this is at the heart of Christianity: the first Christians engaged in cognitive dissonance reduction to square with Jesus' death. In any case, that's what all of apologetics involves. It is an attempt to make the nonsensical sound intelligible. "What you allude to is cognitive dissonance reduction." Scientists may be wrong about the Second Law of Thermodynamics. I agree with the Amazing Atheist that randomness (or entropy) in the universe may have begun decreasing some time after the Big Bang. My hunch is based largely on what's happened in biological evolution. Evolution (at least on Earth) kicked off late in the universe's history, but it's made a lot of progress in organised complexity in a very short time. Ditto human scientific progress, which took off in a big way only about 200 years ago, despite at least 100,000 years of homo sapiens being around. I suspect that entropy is cyclical and the universe is 'bouncing back' to its original highly improbable low entropy state. The key question is, can we prove the Second Law, or is it just dogma? When it comes to science, ye must have faith. The only laws that exist in this Universe are the laws we ourselves create. Imperfect or uncertain as they or we are of a nature that is truly boundless, eternal, and perfectly free, how One wishes to be. Man is the measure of all things an old Greek once said. Science is the religion or practice of measure of a nature that again is measureless. Light has no speed limit until we measure it so. Gravity has no waves until we create a measurement for them. Time is another measure of human construct fashioned to rule or control our lives as it surely does. Have you felt the natural state of liberation when time is removed from your day to day activities? Try it and see! Try removing these dogmas from your life, the rules, the measures, the science, the religion, the uncertainties and beliefs, its been done before. Find a stove in Ulm, remove everything from your thoughts and behold "I", Oneself, One true self, timeless, measureless, boundless, natural, universal, and free. But rather than inserting things like God and science, stay there and just be. Lecture by Dr John Hartnett, Associate Professor of Physics at the University of Adelaide. More on scientific dogmas, enjoy this debate between a high school science teacher (young earth creationist) and a professor of biology (leading evolutionist). I'm not sharing this to promote young earth creationism, but rather to show that Darwinian evolution has some glaring holes in it (as does young earth creationism, on current evidence). The highest point at January 2016 represents 100% (the baseline). That means there's been a 90% increase in searches for 'flat earth' in the previous year. Some of that has to do with an obscure American rapper called B.o.B tweeting in January that the Earth is flat. Ordinarily, that doesn't merit a response. But the mainstream media were all over it. Much of that coverage was due to a televised and tweeted response to B.o.B by none other than Neil de Grasse Tyson, Director of the Hayden Planetarium and a well-known astronomy pundit. Why would Tyson bother to respond to a rapper about something that was supposedly settled in the 16th century? Talk about overkill. Surely, B.o.B (and flat earth theory) would have got a lot less attention if Tyson had ignored him? Things just seem to get stranger. According to the standard flat earth account, the earth is a disk with the South Pole at the center and Antarctica spread all around the edge. Coincidentally, the US ran a few massive expeditions to Antarctica in the '40s and '50s (Operations Highjump and Deep Freeze), then declared the area pretty much off-limits to all but a few 'scientists' in 1959 via the Antarctic Treaty. You can book the odd cruise to Antartica, but you'll only be allowed to hang around a small area of the coast (even the South Pole isn't that far inland). No mining, no oil exploration, no mass tourism, none of the things that Uncle Sam brings to every other part of the world, and damn the environment. Why all this publicity now over a supposedly crackpot theory? Why is Antarctica (the size of US and Mexico combined) off-limits to most people? The Earth is relative to One's perception, is it not? If I lived on the Great Salt Lake I would argue the Earth is flat. And in the mountains I would be careful not to fall off a cliff or the edge of the planet. From the moon I could only guess that the Earth appeared round. And from further out in space my perception of the Earth would not even exist. Surely the Earth is round, or is it whatever we believe? And as for measuring the truth of Nature be it Earth or even ourselves, The real question is: Is nature measurable or is everything as science would have it, uncertain at best? Apologies, I just noticed that the flat earth video I posted above (200 Proofs Earth is Not a Spinning Ball) had some racist nonsense tagged to the end of it (from 1:56:07). I'd like to request that the post (or at least the video link) be deleted. Thanks and apologies again for the oversight. BTW, when do you think we got our first, and ONLY, 24-hour public 'live' feed of Earth from space? This is allegedly taken by "four commercial, off-the-shelf, high-definition cameras in a box bolted to the outside of the Space Station." That's right, four off-the-shelve cameras you can buy. One Toshiba IK-HR1, two Sony FCB-EH4300s and a Panasonic AGHMC150. BTW it's only a 12-hour feed, because half the time the Space Station in on the opposite (i.e. 'dark') side of the Earth from the sun. And it doesn't show the whole Earth spinning in space, because the Space Station is too close to Earth for that. You mean to tell me that in the last 50 years of space travel, we couldn't bolt a camera to the outside of a (presumably solar-powered) satellite to get a 24-hour public live feed of the Earth? And when we finally do, CGI technology has reached the point where we wouldn't know the difference anyway? Try this little experiment. Grab a ruler and hold it up against the horizon in those photos, or at any point in the videos. Note that when the rocket rises, the horizon doesn't fall away as it should on a ball earth, but rather rises up as on a flat plain. Also read the comments at the bottom of the article. Notice the switch from convex to concave horizons, and the exaggerated curvature of the Earth, the sort of result you get from a fish-eye lens. Feel free to apply the ruler test at any point you see the horizon. No fish eye lens in this one. To understand the significance of flat earth theory, we need to grasp what's at stake. Some may argue, "So what if the Earth is a disc? Why should the elites try to hide that?" Much depends on the version of flat earth theory in question. There is one version that, if true, the elites would make EVERY effort to cover up. On that version, the Earth isn't a flat disc in space, it's a circle (bounded by Antarctica on all sides) on an INFINITE plain. Just ponder that for a minute. Infinite land = infinite resources. What keeps us at each other's throats and allows the elites to control us? SCARCITY. Primarily, LAND scarcity. What happens if there is no more scarcity? No more elites. If you don't like your rulers, just move away. Unless, of course, your rulers told you that you're living on a globe and there's nowhere to run. And just to be sure, they surrounded your neighborhood with a two-mile high, thousands-mile thick wall of ice, that you have to cross 1,000 miles of ocean to get to? Then made that wall (i.e. Antarctica) off-limits to pretty much everybody? If you somehow discovered that you're living in a bounded circle on an infinite plain, what would you do to explore as much of the land outside the circle as possible? The sensible thing to do is build the biggest rocket you can, rig it with cameras or human observers and shoot it straight up, taking 360 degree footage of the surrounding land as you rise. The more powerful the rocket, the higher it goes, the more land you can see. All you need is an excuse to build the biggest rocket ever. The space program began after the United States carried out several of the largest expeditions ever to Antarctica, ending in the late 1950s with the Antarctica Treaty that restricted access to the region. Perhaps they discovered the land beyond? The idea of Earth as an infinite plain resonates with a lot of Christians. For one thing, why would a good God be less than infinitely generous? Secondly, the infinite plain model is closer to the biblical account. The English translations of Genesis 1:1 read, "In the beginning, God created the heavens and the earth." Most people assume that 'earth' refers to planet Earth. The Bible NEVER refers to 'planet Earth'. The Hebrew word translated 'earth' in the Old Testament is 'eretz', which simply means 'land' (Strong's Hebrew 776). So Genesis 1:1 literally reads, "God created the heavens and the land." No planets. The only large-scale features mentioned in Genesis 1 are stars, moon, sun, heavens, land. If scientists today can believe in an infinite universe that exploded from nothing, there's no prima-facie absurdity in the idea that we live on an infinite plain with the heavens above it. Just when you thought it couldn't get weirder. How long do you think it took NASA to take another photo of the whole Earth after the Apollo missions? July 6, 2015, to be precise. That's right, last year. NASA has (ostensibly) produced images of Earth before, but they were 'composites' of images taken by low-orbiting satellites. You can see it for yourself in that Independent article. BTW, when was the last time you heard of a satellite being knocked out by a meteor, asteroid or space debris? "After 53 years of sending equipment into space, planet Earth has accumulated a thick mantle of space debris. We are able to track about 20 000 objects—although the estimates that account for objects under 10 centimeters in diameter put the total number closer to 600 000. When a satellite hits an object in this belt, the collision may cause the satellite to splinter into many fragments, which then add to the accumulating debris." "Every day, more than 100 billion meteoroids larger than one microgram enter Earth’s atmosphere, traveling at more than 11 km/s ... The threats are the really small meteoroids—under 0.05 millimeter in diameter—which exist in much greater numbers. These interplanetary flyspecks aren’t big enough to make flashes in the atmosphere visible to the naked eye ... but for satellites, they can be lethal." BTW, here's some amateur rocket footage from twice that height, 121,000 feet. Still looks flat. As you can see, it's pretty flat; because an asteroid that size literally makes a dent. The article states, "The rule is that big moons orbit big planets. The Earth-Moon system is the EXCEPTION to that rule." Quote: "Earth has the HIGHEST density of any planet in the Solar System, at 5.514 g/cm3." If we've underestimated the Earth's size, then we would have to give it a high mass to account for the gravity. Thirdly, even leading paleontologists like Stephen Gould have noted the paucity of transitional forms in the fossil record. "The extreme rarity of transitional forms in the fossil record persist as the trade secret of paleontology." Stephen J. Gould - "Evolution's Erratic Pace," Natural History, vol. 86 (May 1987), p. 14. If we've only searched a small part of the Earth's surface, that would explain the discrepancy. Furthermore, as that 'ground zero' article explained, the asteroid impact would liquefy the rock layers and eject the top layers out to the sides (i.e Antarctica). Since impact craters have very specific effects on geography and geology (they leave various metals in the ground, etc), it shouldn't be difficult to test the theory just from the current literature. Re-sizing the Earth might solve a number of astronomical problems as well. Correction: That should be "round the edge is Antarctica, NORTH Pole in the center"
I should clarify that by Earth having "the highest mass" of all planets in the solar system, I mean mass per cm3 (i.e. density), not total mass. Just realized the 'big Earth' hypothesis runs into a problem in explaining the orbits of the Sun and Moon, in standard astronomical terms. The Flat Earthers have an advantage in this regard, since they can argue that the Sun and Moon are artificial (which would explain why they're the same size as viewed from the Earth), and therefore follow non-standard orbits. Of course, it's possible that the same is true of 'big Earth', but that entails abandoning any attempt to explain the anomalous evidence in standard astronomical terms, which was the only real advantage of 'big Earth'. So we may as well go all the way down the rabbit hole, wherever that leads. Whatever the case, the powers-that-be are definitely covering up something big, to do with how Earth looks from a high altitude (I hesitate to say 'space' because at this stage, bets are off on whether that even exists). The smoking gun was the 43-year absence of an attempt to photograph the whole earth from 'space', between the Apollo missions and July 6, 2015 (as documented above). There is simply no excuse for that, unless they don't want us to know what the Earth looks like from that distance, and all the photos we have are faked, either from scratch or from manipulated low-altitude images of parts of the Earth. We have to concede that as far as the cover-up goes, the Flat Earther's are on to something. "'We don’t see any difference between the Earth’s and the Moon’s oxygen isotopes; they’re indistinguishable,' said Edward Young, lead author of the new study and a UCLA professor of geochemistry and cosmochemistry." They're pulling out all the stops now; too much, too late. 40-plus years of no photos of full Earth from space, then three came at once (one in 2015 and two this year)! Would this have anything to do with the recent resurgence of flat-earthism? "pretty much the same constellations are visible from all parts of the 'southern hemisphere' (the edges of a flat Earth), but of course, not from the 'northern hemisphere' (the center of a flat Earth) where other constellations are visible. How is this possible on a flat Earth, where the same constellations should presumably be visible from everywhere?" Maybe that explains this odd sculpture at the Vatican? A key strength of the Concave Earth model is that while accounting for the north/south stars, it also allows for large flat areas over water, sand or sediment (think of a bowl of water or cereal). A convex surface doesn't allow that. Coincidentally, the Bible prophesied that in the end times, "the stars of the sky fell to the earth, as a fig tree casts its unripe figs when shaken by a great wind" (Revelation 6:13). Today, this prophecy is scoffed at because we're told stars are millions of light years away, and each star is millions of miles across. However, on the Concave Earth model, the stars are only thousands of miles away, and each is possibly as small as a house. Given that the surrounding Earth is by far the largest mass in this system, and therefore has the highest gravity, it follows that stars will come hurtling to Earth if they are ever dislodged from the 'universe' at the core. According to the Bible, this event is preceded by the entire sky going dark (Isaiah 13:10), which suggests a power failure in whatever is holding the 'universe' together. There's another possible explanation for why the sun appears to rise from below the horizon on a concave earth. Atmospheric refraction can reverse an image and the direction it appears to be moving in. Since scientists presume the Earth's surface is convex, they assume the sky is concave when viewed from below. Hence, they discount the possibility of image reversal by atmospheric refraction, because a concave lens does not reverse images. However, a convex lens does (i.e. the atmosphere of a concave Earth when viewed from the ground). In short, we have that all evil or all benevolence are always from the human point of view, as well, every individual has his own concept of good and evil. So how can we attribute the God exists or not, and only if, we can attribute His existence to the way we understand the world? It doesn't make a serious attempt at debunking concave earth theory (which it unhelpfully lumps together with 'hollow earth', an entirely different theory). Instead, the writer cherry-picks extreme versions of concave earth, Teed's and Abdelkader's (and even manages to bring in the Nazis), then argues with reference to these that the concave earth hypothesis is unfalsifiable and therefore unscientific. Two questions. Firstly, why pick on Teed and Aldelkader, instead of a more 'standard' version like Stephen Lord's (above)? Secondly, why pick on concave earth at all, if this theory is a fringe-of-the-fringe idea? If the writer intended to illustrate the perils of unfalsifiability, why not choose a more popular example like maybe the 'fake moon landing' theories that are more widely held? I don't think that Evil God Theory is absurd. Rainbows and ice-creams? That reminds me of a cow that is about to be slaughtered, yet it thinks, "They fed me and cared for me for so long. Clearly there's no reason for them hurting me..."
Maybe you listing those happy things = a POW in concentration camp who has found some breadcrumbs. "Have a nice one because later I'll crush all your dreams." Something like that could possibly work as an Omnimalevolent God.